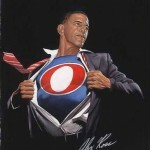 Super Obama To the Rescue! I witnessed history in the making last night, and it was wonderful. My neighbours south of the 49th parallel elected a President based on his views, his politics, his timely promises and the strength of his character, all while looking past the colour of his skin. Barack Obama was elected the 44th President of the United States, the first African-American to hold that post. The victory speech given by Obama was one that fit the special occasion perfectly. Like his other speeches, it was inspirational and uplifting. His was a historic speech that will be remembered for a long time to come. McCain’s concession speech was also pretty special. The only dark cloud on the occasion was the crowd booing when Obama’s name was brought up. I’m not delusional to think that Obama will be able to fix all the problems, caused by 8 years of the Bush administration and even the Clinton era, in a day, a month, a year, or even during his 4 year term. Fixing that amount of damage will take time. But even if he is only able to keep half of the promises that he has made, the United States will be better for it. I was asked on a message board as to why, as a Canadian, do I care about the election of Obama. Being Canadian, we are so closely tied to the United States in every facet; our culture, our entertainment and our economy. As Canadians, we have a vested interest on what happens to the south of us. I believe that Obama will not only be good for the US, but will also repair international relations and make its neighbours and allies better and stronger economically. Obama has been compared to Kennedy or called the Kennedy of our generation for a reason. As Canadians, we can only wish that we will see a politician of this caliber in our lifetime. Obama, even as a Canadian, I proudly shout “Yes we can!”. President-Elect Obama, the world is watching and cheering your victory.